Practice Embedded System questions and answers for interviews, campus placements, online tests, aptitude tests, quizzes and competitive exams. This set of Embedded Systems test focuses on “RISC Exceptions-II”. 1. Which of the following can be done to ensure that all interrupts are recognised? Explanation: The exception handler performs some kind of handshaking to ensure that all the interrupts are recognised. 2. How many types of exceptions are associated with the asynchronous imprecise? Explanation: Two types of exceptions are associated with the asynchronous imprecise. These are system reset and machine checks. 3. How is the internal registers and memories are reset? Explanation: By doing the system reset, all the current processing are stopped and the internal registers and the memories are reset. 4. How is the machine check exception is taken in an asynchronous imprecise? Explanation: The machine check exception is taken only if the ME bit of the MSR is set. If it is cleared, the processor will enter into a check stop state. 5. Which of the following are the exceptions associated with the asynchronous imprecise? Explanation: The machine check and the system reset are two types of exceptions which are associated with the asynchronous imprecise. 6. Which of the following possesses an additional priority? Explanation: The synchronous precise exceptions provide additional priority because it is possible for an instruction to generate more than one exception. 7. Which of the following has more priority? Explanation: The system reset has the first priority then comes the machine reset, next priority moves for the instruction dependent, and the next priority is an external interrupt, and last priority level goes for the decrementer interrupt. 8. Which bit controls the external interrupts and the decrementer exceptions? Explanation: The EE bit in the MSR controls the external interrupts and the decrementer exceptions. 9. Which bit controls the machine check exceptions? Explanation: The ME bit in the MSR controls the machine check interrupts. 10. Which bits control the floating point exceptions? Explanation: The FE0 and FE1 control the floating point exceptions. 11. Which of the following is a 16 kbyte block? Explanation: The vector table is a 16 kbyte block which is divided into 256 byte divisions in which each division is allocated for particular exceptions and it also contains the handler routine associated with the exceptions. 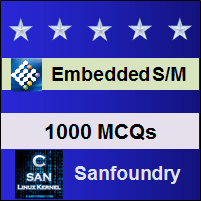 Sanfoundry Global Education & Learning Series – Embedded System. To practice all areas of Embedded Systems for tests, here is complete set of 1000+ Multiple Choice Questions and Answers.